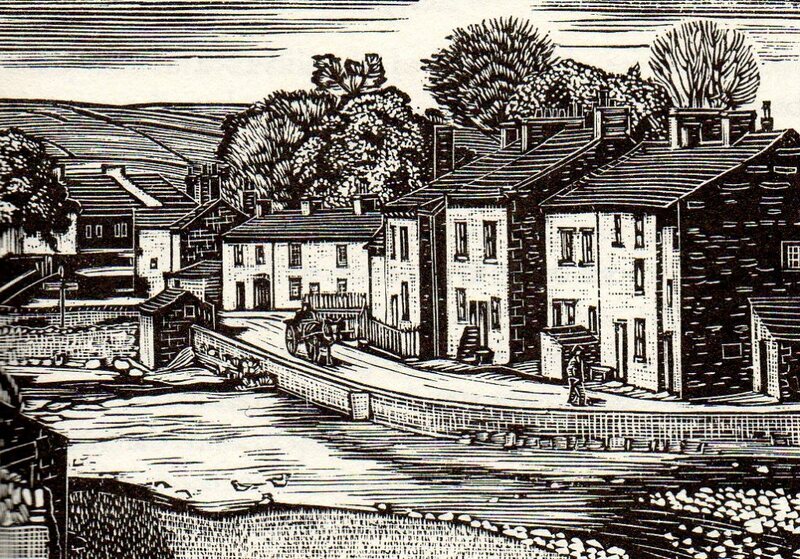 Happy 507th Birthday to Hebden Bridge. 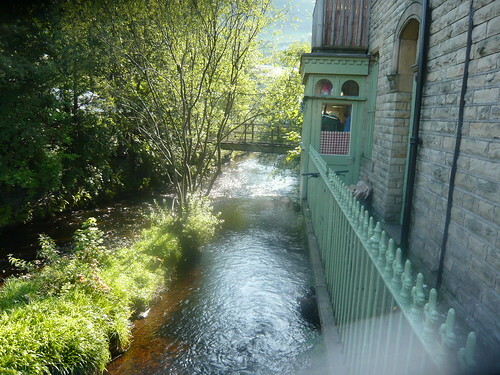 The packhorse bridge over Hebden Water originated in 1510 and if you needed an excuse to visit this quirkly town in Calderdale the year long birthday celebrations may be what you were waiting for. It has just been awarded the best small market town. 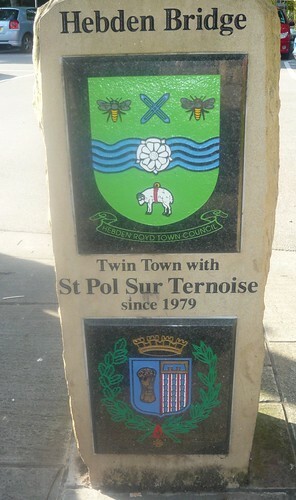 A well deserved award after the town pulled together after the 2015/16 Christmas floods. When the Industrial Revolution descended on Hebden Bridge the hill sides were too steep for the area to loose its identity. The domestic activity of cloth manufacture and early ready made clothing thrived. This can still be seen in a row of houses called Machpelah, named after the Baptist minister, with special small windows for fustian cutting. Fustian is a thick, twilled, short napped, cotton cloth used mainly for men’s wear. The active historical society at Hebden Bridge has an interesting article about a Fustian factory strike at the turn of the 20th century. 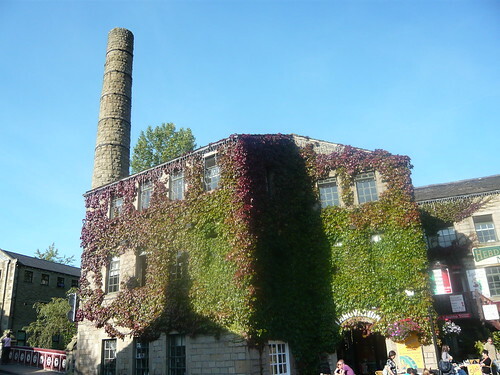 There is a lot to see in the town but do not miss a trip up Hardcastle Crags a National Trust Property which they claim is a ‘Beautiful wooded valley with 19th-century Gibson Mill at its heart, an exemplar of sustainable energy’. 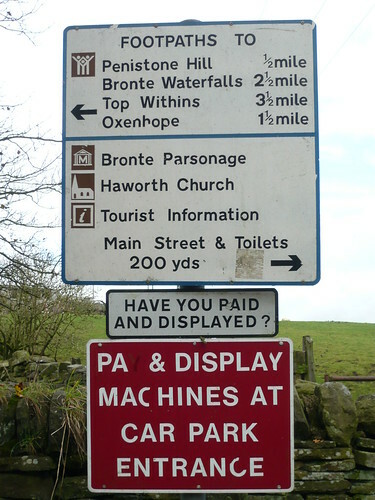 Heptonstall is linked to Hebden Bridge by the Buttress, a narrow pack-horse track paved with setts and as precipitous as any East cost village like Staithes, Robin Hood’s or Runswick Bays. Midgehole is the start of several enjoyable walks and with a name like that who can resist. 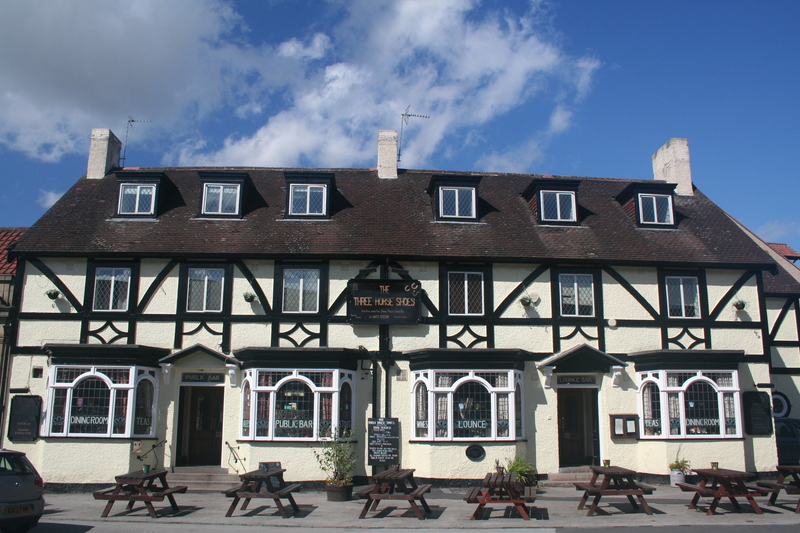 In an evening there are many pubs including the White Lion dating from 1657 or the more modern art deco 1920’s Picture House. Take a walk or evening stroll along the canal or alongside the river Calder. When you are tired of walking there are mountain bike trails and some great hill climbs for the avid cyclist. 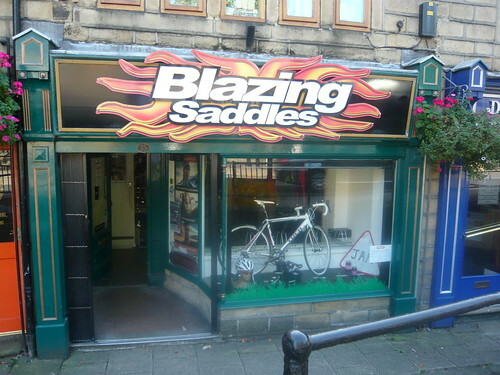 perhaps your bbike was bought or hired from this cycle shop. My simple advice would be don’t do it, parking in Haworth that is, unless you are prepared for the clampers. I had heard many apocryphal tales about the private car park at the top of main street in Haworth where they obsessively look for cars not parked straight or ones that over stay be one minute. Even Christa Ackroyd has commented on the parsimonious way the owner treats visitors to Haworth. Having just ‘parked myself for a cuppa and butty’ in the excellent Apothecary Tea Rooms I saw the sign warning tea drinkers to drink up and check their car or risk a £75 clamp or worse. Knowing I had parked at the bottom of the Cobbles in a council car park I was less worried except I had been unable to pay in either of the broken and vandalised parking machine. The signs told me numerous time to pay on entry but I would look like these former parkers if I had waited to get a ticket. 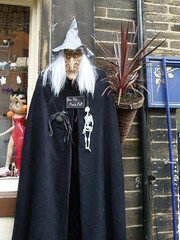 It was Halloween weekend and the whole of Haworth had made an effort to join in the spirit with spirit. 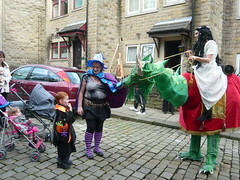 Eight foot dragons roamed the cobbled street and the wicca influence was wicked. The town is ideal for this sort of festivity and a walk around the church grave yard crammed with Gothic grave stones was spooky. 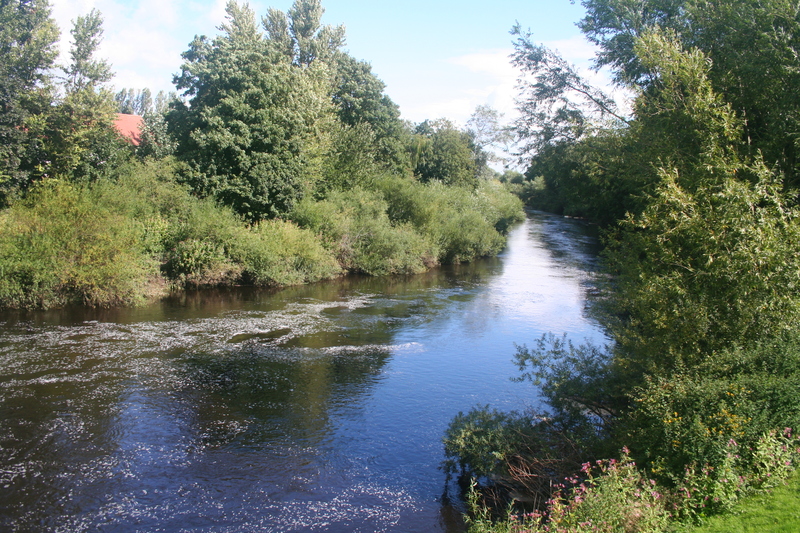 Walk along the flowing River Nidd or cross the bridge for Afternoon tea at a local cafe. From St Mary’s churchyard up on the hill there is a grand view of the valley and some interesting and notable graves. Around and about are visitor traps including How Stean Gorge, Brimham Rocks and Stump Cross Caverns but the best walks for me are the many solitary rambles over the hills towards Grassington or Masham. 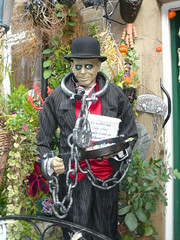 Pateley Bridge is a market town that grew with local lead mining and now excels with colourful summer floral displays. 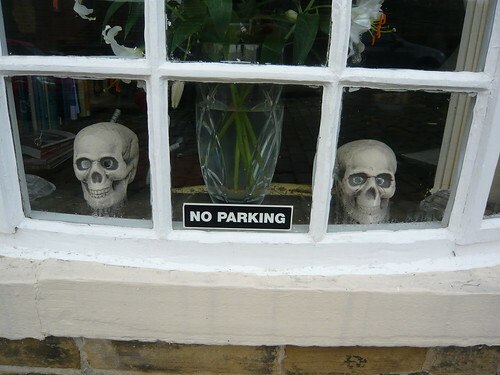 It has won the Britain in Bloom competition a couple of times and should keep the trophy next time. It is the home of the Nidderdale Festival and one of the country’s finest Agricultural Shows. The narrow streets slope steeply up from the valley lined with shops, cafés, art studios, guest houses and the ever important public houses. The main High Street dates to 18th and early 19th century with bow fronted shop windows and handsome classical porches that now offer visitors a variety of shopping experiences. England’s oldest sweet shop can be found here (or at least the oldest sweet shop in Pateley ed.). Also worth seeing in the craft workshops are a glassblower, a jeweler and a potter, not forgetting a visit to Pateley Playhouse ‘Little Theatre of the Dales’. High above the town are the ruins of the medieval St. Mary’s Church dating from 1321. Nidderdale Museum shows how ordinary people lived, in imaginative and realistic settings. There are sections devoted to Agriculture, Industries, Religion, Transport and Costume. The main body of the church is hidden by a cluster of cottages, shops and the Liberal club below. You can access the church grounds by one of three flights of stone steps that cut through the surrounding buildings. 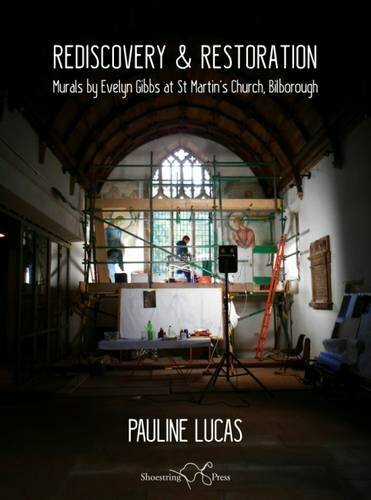 The 15th century wall paintings, some of ‘the most extensive and valuable examples not only in Yorkshire but England’, were hidden by limewash and over the centuries forgotten. In 1852, when work on the interior revealed these treasures many visitors came, only for the murals to be rewhite washed by Vicar Ponsonby three days later and so it remained until 1937. Entering the church from the south door the huge figure of St Christopher is the mural you see on the north wall a favourite position for this painting. It is thought that to look at St Christopher gave protection for the day from sudden death (fast drivers may not benefit). There are many other murals including St George, St John the Baptist, St Catherine of Alexandria and the Decent in to Hades. These murals were originally intended for education as well as devotion and may have been based on wood-cuts from travelling artists. If you are interested in murals there are other fine examples at St Agatha’s, Easby near Easby Abbey close to Richmond. The Great North Road has been in use for centuries. Romans used it when they set up in nearby Aldeborough, , Highway robbers sought out travellers between Scvotland and London and motorists have driven many a mile on its tarmacked surface. 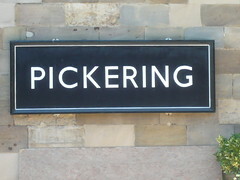 In Yorkshire it runs from Rossington, Doncaster via Tadcaster and through Boroughbridge until it reaches Darlington and beyond. According to becausethey are there.com ‘The Great North Road split at Boroughbridge, above York, the easterly branch taking the direct route to Northallerton, Darlington, Durham, Newcastle and the Scottish border. The westerly branch followed the Roman road of Dere Street to link up with the trans-Pennine Roman road to Carlisle (now the A66) at Scotch Corner, before veering back through Barton to rejoin the easterly route on the outskirts of Darlington’. Marie Hartley MBE would have been 104 this week had she not died in Askrigg at the age of 100. Fortunately there is a significant legacy of 33 books chronicling the Dales, numerous paintings and wood cuts and The Dales Countryside Museum at Hawes. Marie, born in Morley, went to the Leeds College of Art and the Slade School London where she specialised in wood engraving. She worked with two other redoubtable women Ella Pontefract and then Joan Ingilby. With fellow Dales affectionado Ella Pontefract they published ‘Wensleydale’ in 1936 and many of the insights remain true today. 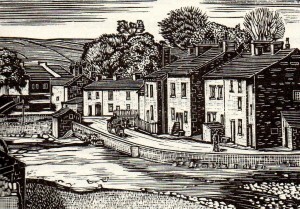 For example they noted that may villages were built like little clumps up both sides of the valleys but ‘often two of them come together like sisters, as Hawes and Gayle, Bainbridge and Askrigg, Redmire and Castle Bolton.’ In 1936 not unlike now milk and cheese were the most important products of the local farms. Via the Milk Train, over 2 million gallons of milk a year were sent to London as part of the Milk marketing board’s sales campaign, using the Wensleydale Railway. ‘The Old Hand-knitters of the Dales’ was a 1951 book with Joan Ingilby that chronicled the development of knitting throughout the dales. Sold at Richmond Market, stockings and knitware were made in the homes of Gayle long after it declined in other parts of Yorkshire. Knitting started in the mid 16th century and it continued to be a successful activity, employing 400 knitters in Hawes homes, until the advent of machinery towards the end of the 19th century. Gayle Mill started life in 1784 as a cotton-spinning mill, powered by a 22′ diameter overshot waterwheel, and over the next century, as economic conditions in the Dales changed, was also used for spinning flax and then wool for the local knitting cottage industry in the valley. 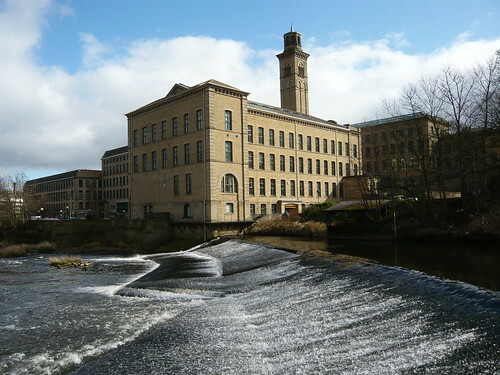 Marie would be pleased to see the story continue into the 21st century as the latest sustainable technologies enable Gayle Mill to be create all its own carbon-neutral energy for heating and power from it’s reopened water powered generation system. Visit Gayle Mill and see how it has benefited from the BBC restoration programme. Hovingham is in great farming country on the North Yorkshire Moors. Whilst farmers are notoriously hard to please it must be a joy to work here with the animals and crops. The parish is large containing Coulton, Scackleton, and six other townships. Hovingham, formerly a market town, is situated in the vale of Ryedale. There were three mineral springs, yielding respectively sulphurous, chalybeate, and clear water. 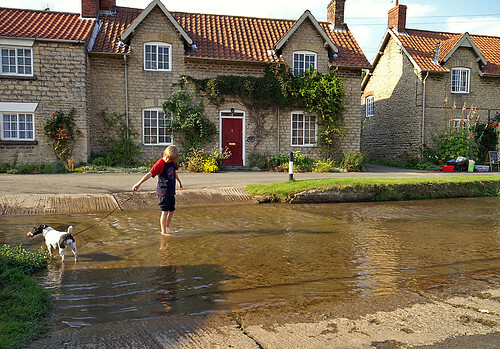 Originally Hovingham was the site of a Roman bath. Ancient parish information is available from the local historian. Hovinham Hall, for 440 years, has been the home of the Worsley family. The Palladian house was built in 1770 and is open through June. Hovingham Womens Fellowship is just one of the community activities in the area. Sport is taken seriously with Tennis, Cricket, Bowls and Table Tennis clubs all active. A full community plan can be downloaded from this pdf. All Saints Church (above) was rebuilt in 1860 retaining its Anglo-Saxon tower and a number of other early features including a Saxon west doorway and a 10th century Saxon wheel cross inset over the south belfry. The Hovingham Estate has been in the ownership of the Worsley family for 450 years. It is a thriving rural Estate, in the heart of North Yorkshire located 17 miles North of the City of York. The majority of the Estate lies within the Howardian Hills Area of Outstanding Natural Beauty. About a mile from the village is The Spa, which is much visited during the summer months by invalids; the waters are of a sulphursodaic character, and there is also a copious and very strong chalybeate spring, and one of pure rock water.